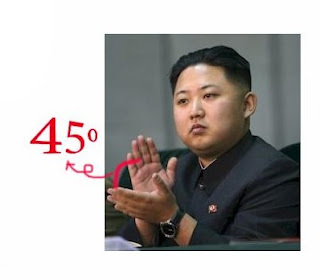 I still remember the moment--two months ago--when I had searched for Kim Jong Un's voice on the internet. The North Korean leader had appeared more than frequently in the news around the globe, but no one really knew well what he sounded like when he spoke. It was not different even for a South Korean: All that came to my head when I thought of Kim Jong Un was just a static image of him clapping his hands in silence while watching another missile being launched. Notable fact: his hands are almost always tilted 45 degrees when clapping. So, it was quite shocking to see Kim Jong Un shake hands with President Moon with a smiling face, and even give a long speech during the inter-Korean summit on April 27th. His North Korean accent was not as strong as I had expected. Although his voice was a little stiff, if I had closed my eyes I could have thought of it as a voice of any North Korean young man. The only thing I could say was, "Wow." I could feel myself living right through history. I was actually alive at a moment that would surely be in future history textbooks! Just like when the former South Korean president Park Geun-hye got officially impeached, every screen and monitor in the school was turned on, showing the historical meeting of the two leaders. Like everyone else, I could not take my eyes off the TV screen as I excitedly had dinner at the cafeteria. Although my friends were still a bit suspicious of the notorious Kim Jong Un being suddenly nice and friendly, they generally seemed to be relieved and hopeful to see him beam and even make cheerful little jokes. Something that might give you the creeps: There is no way to figure out if Kim has a hidden agenda behind his smiles. But still, what he did was wonderfully courageous (as president Moon said) and could even change the game. As long as I remember (let's say it's the last decade), North Korea has been considered malicious and evil – a common enemy. Look how that perception changed--although a very small bit--after people heard Kim Jong Un promise to bring peace to the Korean peninsula. Being a total hermit and refusing to communicate does not help a country in any way, even with the power to be able to threaten others with nuclear weapons. The Sun won the bet in Aesop's The North Wind and the Sun; A warm bare hand could turn out to be way more powerful than a hand holding a weapon. I hope Kim Jong Un and the North Korean officials notice it and change their minds about international relations.